or week, or month, or year. It all depends on how you look at it! September 15 is the day of independence in all of Central America. After a childhood of celebrating our nation's independence with a picnic or quick BBQ, some fireworks and perhaps a couple of hand-burning sparklers, we jumped, head first, into the experience of independence in Costa Rica. We started hearing about Semana Civica (Civic Week) about a month ago. This is a week of assemblies that are geared toward teaching kids about the national symbols, the history of independence in the country, and of course learning and singing Costa Rica's patriotic songs - all 4 of them (the Hymn of the Flag, the National Hymn, the Costa Rican Patriotism song, and the September 15th Hymn). As Independence Day got closer, we learned that Semana Civica is really more like Dos Semanas Civicas. This is a great way to learn more about the history of a country as a foreigner, and a great way to get out of copying notes for an hour if you're a student! One tradition that we took part in was the running of the torch. The torch signifies the passage of the message of independence from Guatemala to Costa Rica. We went with a group of escuela and colegio students to a community about 7 miles away to wait for the arrival of a torch from another town so that we could run with it back to our own. In all we had about 10 students run the whole distance, there were others that rotated in and out of the bus that was following us, running as often as they felt capable. The run was not the easiest as it took place at 12:30 in the afternoon (not exactly the coolest time of day here), but everyone involved was enthusiastic. There were parents cheering us on alongside the road, some community members jumped in and joined the fun, one woman even chose to run with us while holding onto her puppy (whose bottom half was wrapped in a plastic bag, should it feel the need to go to the bathroom). We arrived at the escuela, hot and sweaty, after about an hour and a half to participate in yet another acto civico (assembly) about independence in Costa Rica. Another one of the traditions here is the Parade of Faroles. On the eve of Independence Day it is said that the message of impending independence was passed through a town in Guatemala and as people were informed they lit candles and lanterns (faroles) and joined in the spreading of the news. In the most basic sense, those of you from the United States can think of the story of Paul Revere spreading the word that the Red Coats were coming. In 1953 the Costa Rican government declared that all education centers will participate in a parade, reenacting this event at 6pm on every September 14. So it was that at 6pm we were at the school surrounded by faroles listening to the national hymns and waiting to march down to the plaza. The students lifted their faroles with pride, showing of their (or their mother's) hard work and creativity. 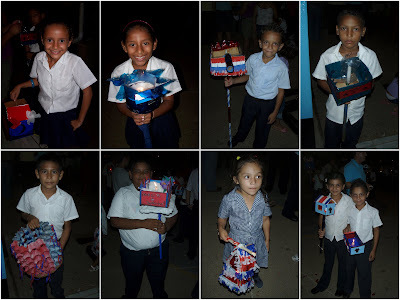 As darkness fell the faroles were lit and we were surrounded by glowing cars, ox carts, stars, houses, torches and anything else that you can make out of Popsicle sticks and plastic. We walked together as a group, hoping that there would not be any unintentional fires set, and finally arrived at the plaza. We had been expecting a little ceremony in the plaza, but the arrival was the end of the formal events. Informal events quickly began, however. Youth began kicking their faroles, causing them to become engulfed in flames. Parents showed their young children how to put their faroles in the flames near-by to create torches. Students started jumping through newly formed bon fires. We left before becoming witnesses to what we feared would be accidents resulting in 3rd degree burns and whatever else may come of a soccer field full of small fires. Independence Day, the 15th of September, came quickly enough. For us, it began at 3:30 in the morning. It a tradition here to go around town making as much noise as is possible to wake everyone up early and remind then that Independence Day has arrived. We had been forewarned that this would happen (thanks to our counterpart being one of the organizers) and we were ready to join in the festivities. The first fire cracker went off at about 3:20 and at 3:30 drums were being handed out to community members. The band played in the street for a couple of minutes before climbing into the back of a cattle truck to play as they made the rounds through neighboring communities. This journey ended back in our town where we walked with everyone through the neighborhood shouting "Wake Up, Wake Up!" and culminating in another mini concert in front of the police station. A couple of fire crackers were thrown a little too close for comfort, some "special drinks" were being passed around, and most people took a crack at the drums. This was quite the experience (and we'll probably be OK passing it up next year in favor of a couple of extra hours of sleep! After returning home, eating a quick breakfast, and taking showers, we headed out to Puerto Viejo for the parade. The parade consisted of bands from local escuelas and colegios and one float from a local pre-school. We may be biased, but our escuela went first and set a standard that others were not able to meet. They are an amazing group of kids that are highly talented and that has the support of many in the community. They were decked out in purple uniforms, followed by the dance team, and were ready to rock. Our colegio was second to last and they took the parade out in style. They showed up with a banner, a horse, their flags, dance teams and band. Without knowing it, we never would have been able to tell that this band was formed roughly 2 months ago. They were great. Our Independence Day (week-month-year) culminated with us crashing after lunch. I love that we are in a country that is so passionate about its history and customs, but there is something to be said for that picnic or BBQ and being able to climb into bed after a quick presentation of fireworks!